Scandal is inevitable in every political party. 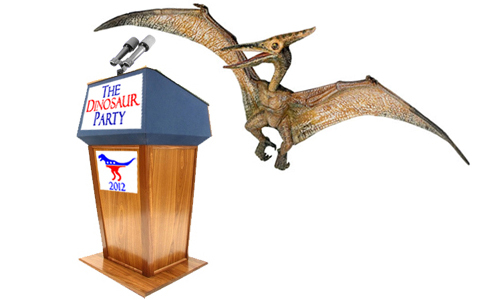 I never thought it would come so quickly to The Dinosaur Party, but unfortunately that's the case. News broke on National Geographic's site last August that the Plesiosaurus, may not have laid eggs like other reptiles, but rather given live birth to its offspring. While this doesn't rule it out that it was in fact a dinosaur, word came out of T-Rex's camp this week about a video they had showing Cam Pane, sneaking into a barber shop. Cam Pane response came (not surprisingly) shortly after hearing that the polls were in and he would not be a candidate: "What you have heard is in fact correct, I am not a dinosaur, but a mammal. Thus I am withdrawing from not only the election, but the party in general. My first love was always the Green Party, and it is to them I shall return. Thank you." With that bombshell we have narrowed down the field by one. By popular vote and default, Phil A. Buster, is the winner of the first round. Now then, let's begin our next round. 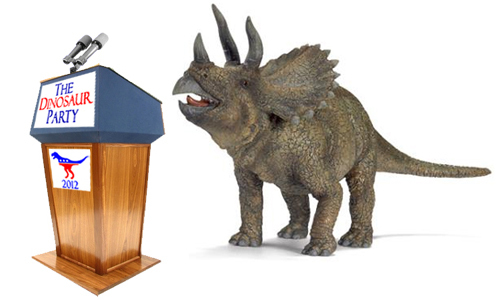 Moderator: Today’s debate is on gun control, and I ask that you keep your remarks relevant to the topic. No, seriously, stay on point! You guys digress faster than a Compy’s sneeze. Okay, let’s begin. Ms. Soph Bocks: Gun control is a serious problem—I’ve even heard of kids carrying shotguns to school. Ms. Staytha Course: That is bad. You should start them on pistols before moving to the bigger guns. Course: One way we could help with that is to put guns in Happy Meals. Like instead of those useless fluffy Disney toys, it’ll be like: a hamburger, fries, and a fully loaded Glock. Bocks: You can’t put a loaded Glock in a Happy Meal. That’d make it way too heavy. Kids wouldn’t be able to carry it, and those little cardboard handles would rip apart. Course: Alright, Ms. I-have-all-the-answers, what would you suggest? Bocks: Separate them. Put the gun in the Girl Happy Meal, and the ammo in the Boy’s Meal. Moderator: No! Look, this is what I was talking about. Stop digressing! In fact, I’m just going to change topics before this gets any worse. Forget gun control. Let’s discuss unemployment. It’s clearly a problem that the next president will have to face. Let’s try this again. Bocks: The way I see it, there are really only two solutions to unemployment: 1. Take the unemployed and give them jobs. Or 2. Take the unemployed and kill them. That would drop unemployment down to zero. Course: Statistically true, I suppose. But, you know, a third solution could be to just give jobless people money. Then being unemployed would be financially the same as being employed. Boom, everyone’s happy. Bocks: But communist countries have really boring flags. Course: True. And I’m not that fond of the color red. Moderator: Alright, stop! You two obviously couldn't stay on topic if I stapled you to it. I’m putting an end to this. Who will move on to the semi-finals? It's up to you to decide. Voting ends Monday at 11:59 PM. And on Tuesday we'll find out which candidate had the survival instinct, and which is just a living fossil. Bocks gets my vote this round! I'm sorry...both of them scare me me. Abstaning this round. I vote for Phil, again! I vote for the moderator. But course, with the slogan, "Communism :)" could win me over. Personally I'm pulling for Bocks on this one. She's got moxie she does. Don't know if I'm allowed to vote (due to authorship conflicts) but I would vote for Bocks. However, she appears to be sweeping anyway, so I guess I'll abstain too, to avoid any further scandals. I'll vote for Bocks! Sorry I'm late.